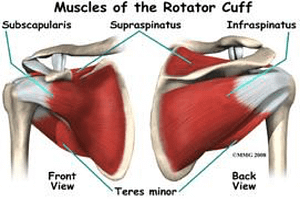 The rotator cuff muscles and tendons hold the shoulder in place and help move it. Age and/or injury can partially or completely tear the rotator cuff tendons and cause shoulder instability. When the rotator cuff tendons are torn, the head of the humerus loosely fits in the glenoid cavity. Movement can cause a partial dislocation (subluxation) or complete dislocation. In many cases, physical therapy can be used to strengthen an injured rotator cuff and improve shoulder instability. A rotator cuff that is completely torn may require surgical intervention in the form of a rotator cuff repair. 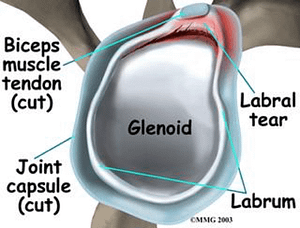 An outer rim of cartilage known as the labrum surrounds the glenoid cavity. A healthy labrum allows the head of the humerus to sit perfectly in the glenoid cavity. A partially or completely torn labrum allows the head of the humerus to move in and out of the cavity. Like rotator cuff tears, labral tears are caused by age and/or injury. The degree of shoulder instability corresponds to the severity of the tear. Small tears may be treated non-surgically. Large, complete tears may require surgical intervention. The most common labral injuries that require surgical intervention are a superior labral anterior to posterior (SLAP) tears and a Bankart tears. Many patients are born with loose shoulder ligaments. When overhead sports and/or activities are performed, the ligaments are stretched and shoulder instability may develop. The best way to treat shoulder instability caused by loose ligaments and repetitive strain is by using physical therapy to strengthen the shoulder muscles, tendons, and ligaments. If shoulder instability is affecting the way you live your life, please don’t hesitate to contact our office to arrange an appointment with one of our orthopedic shoulder specialists. Regardless of the cause of your shoulder instability, we’ll have a treatment option that’s right for you. You can expect results when you choose our clinic.